Well here’s a cool idea. Declan Squared is a fashion-conscious line of microfiber pocket square and handkerchief cleaning cloths – so we can keep our iPads and other favorite touch devices clean and have a bit of style while doing so. Squared is 12×12 inches of incredible microfiber. 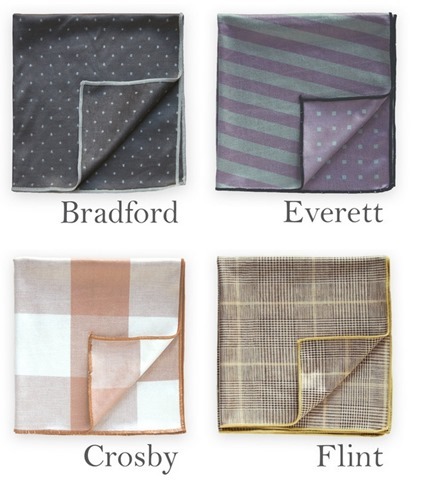 Depending on the particular design of Squared, you may not even know the difference between it and traditional pocket square materials. Some designs look like silk, others look like cotton. We are even in the process of trying to create some that look like wool. The texture of Squared is soft, with an ever so slight hint of fuzzy. I think this is a great idea. Cleaning cloths have become an essential accessory for those of us who use touchscreen devices heavily – so why not make them easier on the eyes. 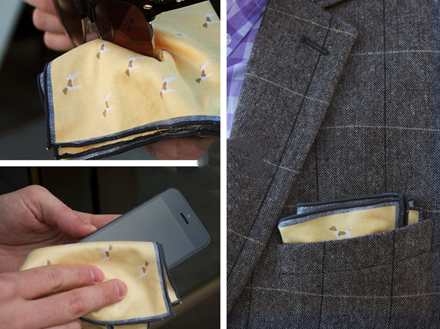 The creators of the project have a number of great looking designs in mind for Declan Squared. If they hit their funding target of $6,000 that will allow for 6 designs initially. For every $1,000 that exceeds the goal they’ll be able to add one additional design. Backing levels for the project are very reasonable – starting at $12 to get a couple of pocket cloths. I became a backer this morning and I’m looking forward to trying these out. You can see lots more detail, a promo video, and sign up as a backer at the Declan Squared Kickstarter page.